Portugal’s venerable Vidago Palace golf resort has gained a second major environmental honour in the annual IAGTO Sustainability Awards. Four years after winning the Community Integration category in the 2015 IAGTO Sustainability Awards, the 118-year-old GEO Certified resort has now been given a Special Award in the 2019 edition. Forming part of the prestigious IAGTO Awards that celebrate the best in the global golf tourism industry and are staged by global golf tourism industry organisation IAGTO (International Association of Golf Tour Operators), the Sustainability Awards are held in conjunction with golf sustainability body, GEO Foundation, and recognise environmental and social excellence in golf. It is only the second time the Special Award has been given since the Sustainability Awards began six years ago. The presentation was made at a gala dinner to celebrate the IAGTO Awards in the Mamorna Hall of the Ljubljana Exhibition & Convention Centre at the end of the International Golf Travel Market in Ljubljana, Slovenia, in front of 1,200 golf tourism industry delegates. 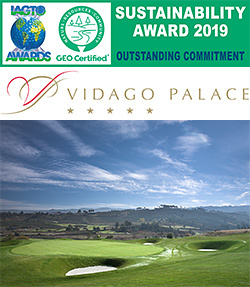 In his citation, GEO Foundation Executive Director Jonathan Smith said: “This year for only the second time, in an occasional special discretionary award, Vidago Palace Golf Course, in Portugal, is celebrated as a club which has displayed an exemplary and ongoing commitment to sustainability, showcasing the exceptional contributions or actions which have resulted in the facility’s recently renewed GEO Certified® status among other media coverage, national and international recognition and awards participation. The Vidago Palace Hotel was commissioned by King Carlos I, who wanted to build a luxury spa resort that could stand alongside Europe’s finest, and opened in 1910. Located one hour from Porto in northern Portugal, Vidago Palace is part of Portuguese beverage company UNICER, owner of the Super Bock beer brand and offers a luxury hotel – a Leading Hotels of the World member – with 70 rooms and suites, a spa with 20 treatment rooms, indoor and outdoor swimming pools, a conference centre and an 18-hole championship golf course where the Portugal Senior Open has been played. Opened in 1936, with a course designed by the Scottish specialist Philip Mackenzie Ross, the Vidago Palace Hotel golf course was renovated in 2010 by Cameron Powell, who enhanced its challenge for golfers. More information: Paulo Ferreira – email Paulo.ferreira@vidagopalace.com, tel: +351 276 990 980.